which gives some hope for climate change! and the music by Mozart, played by a true expert. 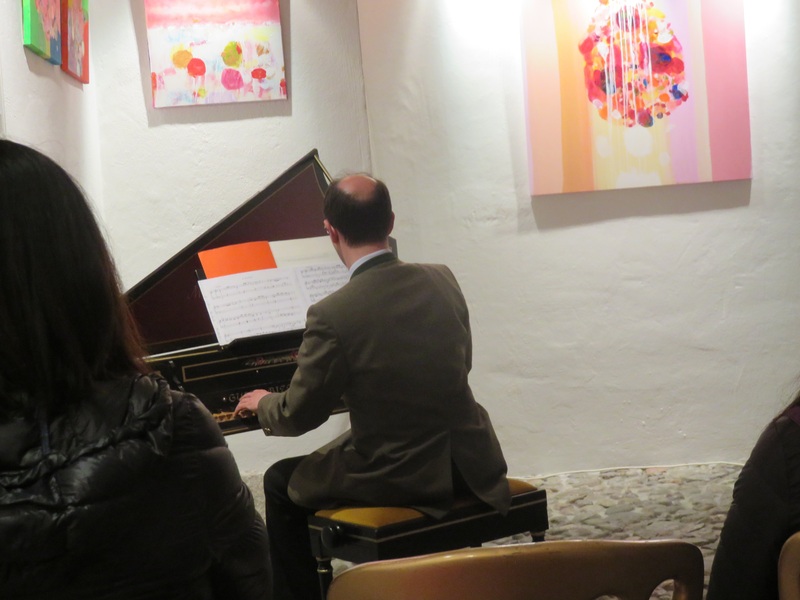 Our final event was back in the Mozarteum for a piano recital by Amerian pianist Claire Huangci. 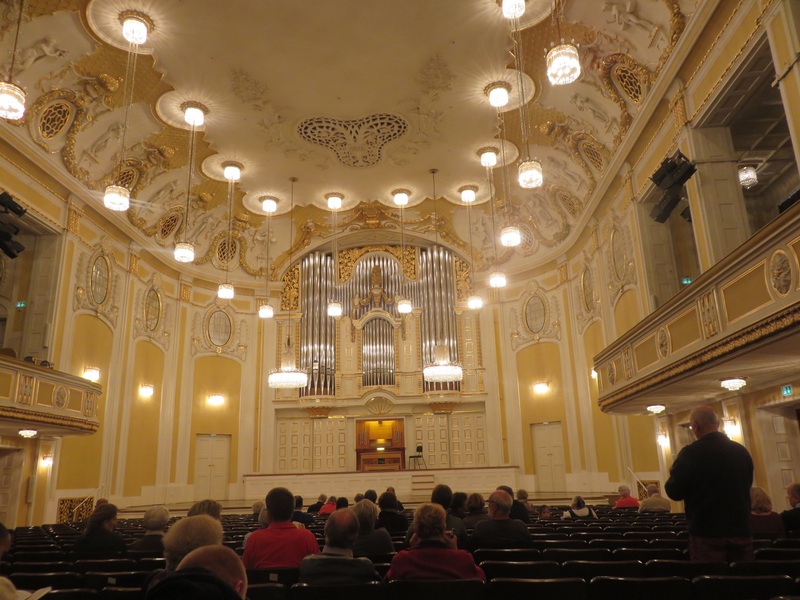 By the evening, the rain had well and truly set in and we foolishly decided to try a more scenic route from our hotel through the Schloss Mirabel to the recital. This Schloss is part of a complex which includes the Mozarteum University and the Mirabel Gardens. The Gardens have a beautiful fountain featured in the Do Re Mi song of the Sound of Music but they also include a number of mazes, where we ended up, lost. Eventually we reached the performance by the wonderful Huangci, who at 25 years old is already on the world circuit of concert performances. Her main repertoire is Chopin so she played all the Preludes as well as a Brahms Sonata, without a note of score in sight. Of course Austria is famous for its cakes. We walked past the Sacher Hotel of torte fame and looked in vain for Cafe Demel, which no longer exists. We did indulge in several different varieties of Apfelsteudel but did note the contrast to Munich. 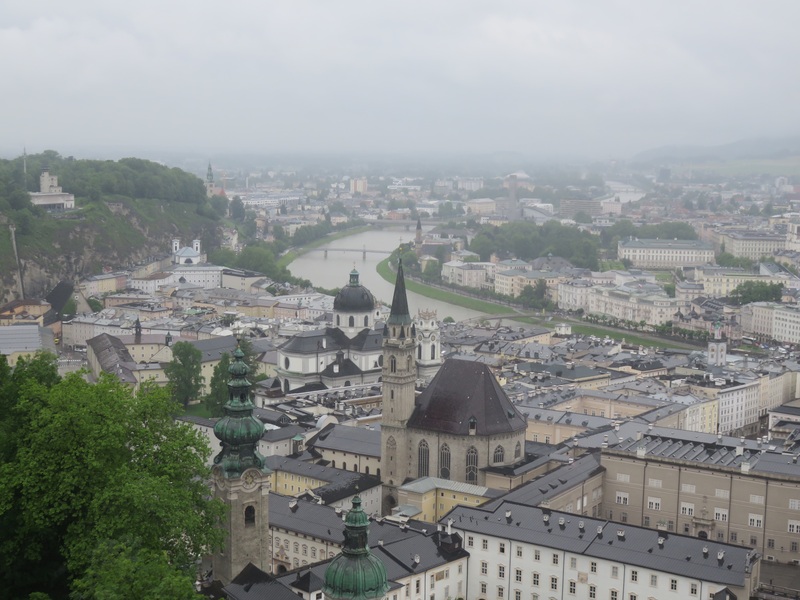 Salzburg was looking much less well heeled than we can remember from former times. 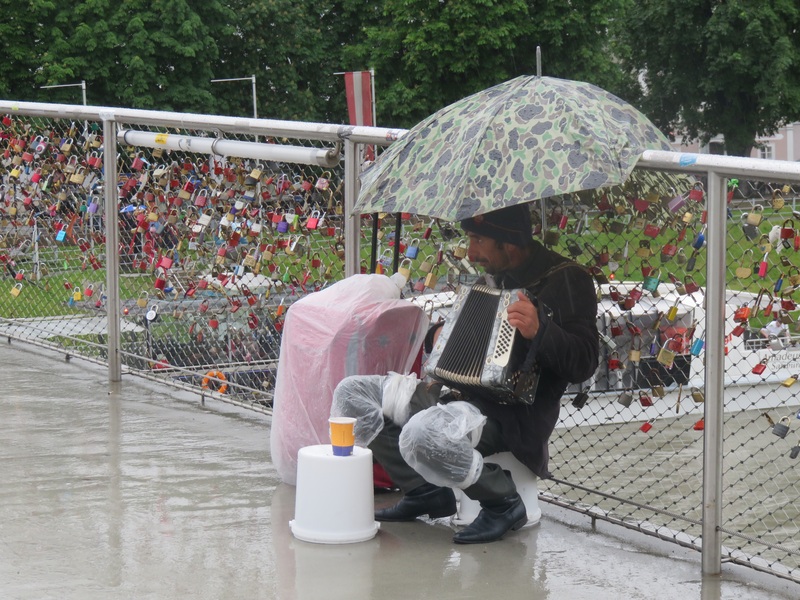 We passed several beggars in a variety of places huddled in the rain, sometimes playing an accordion but often just begging. 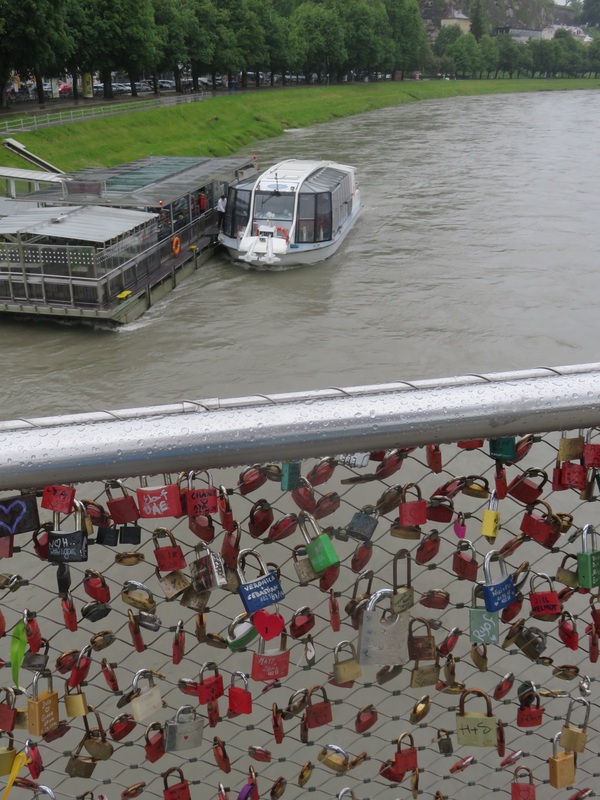 We also noted signs welcoming refugees into Salzburg and wondered if the two were related. 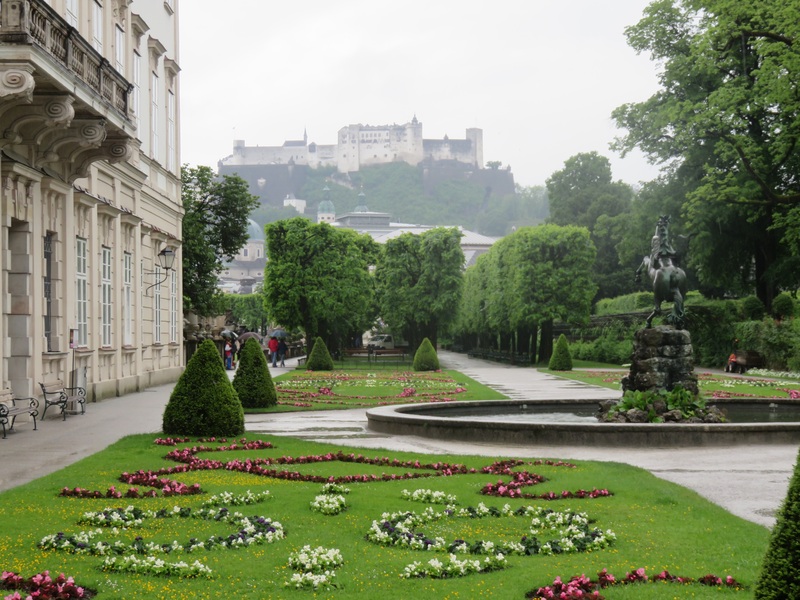 On our second day, we took advantage of our Salzburg Card which for 24 hours gave us free entry to a number of sights, including the Castle Fortress, reached by cable railway, Festungsbahn. The castle was established in 1077, although archeological remains show evidence of inhabitants from 500 BC and then also during Roman times. The town lay on a trading route and provided much sought after salt from the mines in the mountains nearby. The castle provided residence and defence for the Archbishop who held the trading rights and control over the area. The museum showed how people lived in the 13th – 15th century, including how wars – and there were many – were waged. Suits of armour, different weapons and a whole room dedicated to means of torture gave a grim view into life, at that time. We balanced this off by a visit to Mozart’s house, a genteel stroll through a lovely 16th century home, originally called the ‘dancing master’s house’, featuring instruments played by the Mozart family, scores of music and paintings, all to excerpts of Mozart’s music via audiophone. 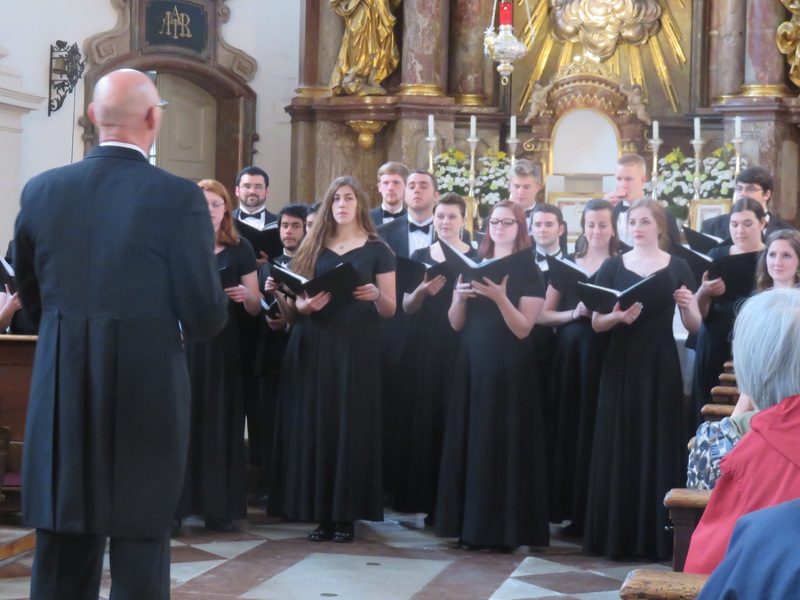 European tour coincided with our visit to Salzburg and we again heard beautiful religious music sung for the cost of a donation. Their repertoire concluded with an old German leid ‘Muede bin ich, geh’ air Ruh’ a children’s lullaby, which Fred said his mother used to sing to him. Afterwards we adjourned to the ‘Alter Fuchs’, the Old Fox, a traditional Austrian Gasthof in an old cellar, where we perched on stools amid a crowd, admittedly of mostly tourists like ourselves. We ate Weiner Wuerstl and sauerkraut and Schweiner schnitzel with a health crumbing of sunflower seeds and pine nuts, filled with vegetables and goat’s cheese! And so to the Eisheiligen! On our third day, the rain had abated so we took a long bus ride out of town to the Untersbergen Cable Car. We drove through green fields with traditional farmhouses sporting their red geranium flower boxes and finally arrived at the cable car station and the Untersbergen shrouded in mist. In the winter this is obviously the local ski resort and the weather beacon at the bottom, showed ‘nebel, leicht wind and schlect’ – in other words, mist, light wind and bad weather! We jumped aboard the cable car with a family of French people, 2 Canadians, 2 Chinese and 2 Swedish cameramen, filming for a Swedish quiz show. Asked what the quiz question was to be, they replied the type of wind which blows on the mountain – answer at the end of the blog! 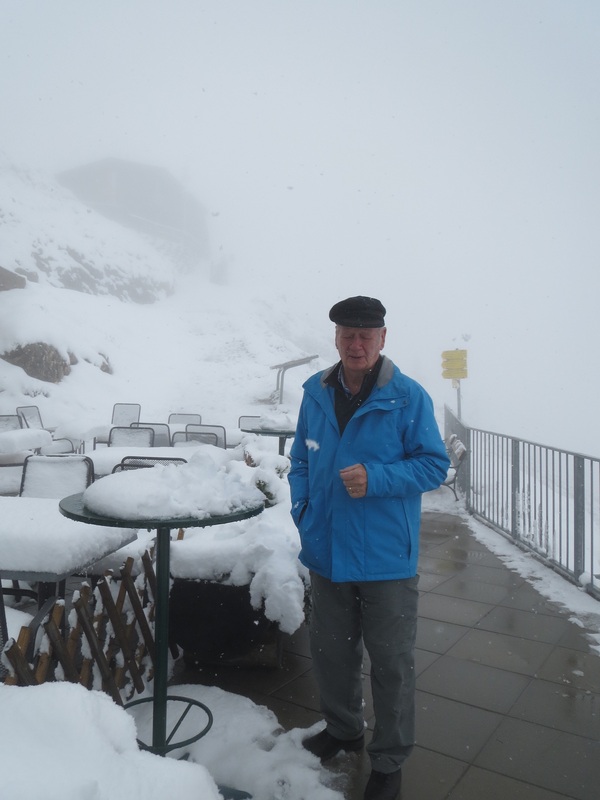 We swung into action and the cable car rocked up the steep mountain side, as we passed over pine and spruce and then small collections of snow until we disappeared into the mist. The brochures stated that we would get spectacular views of Salzburg and its surrounds, including othe peaks of the Alps. Not today. 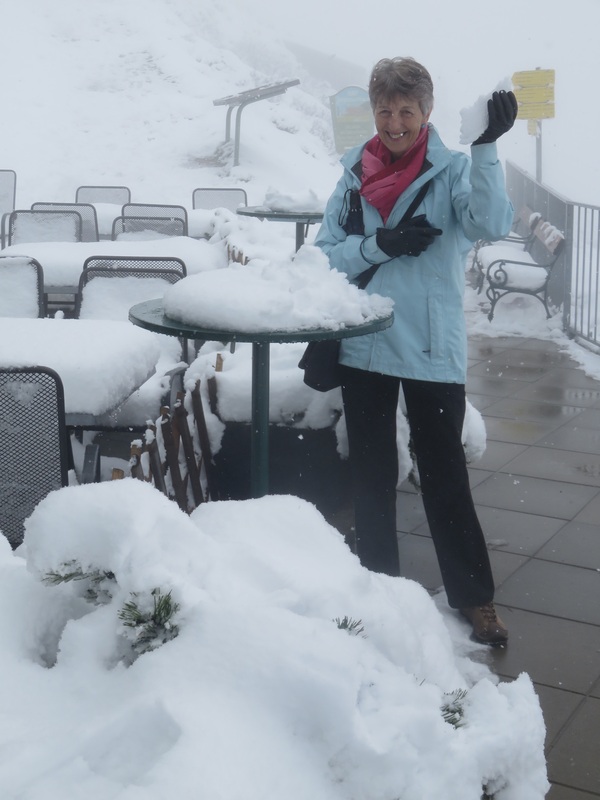 At 1800m and exiting the car into the cable car station, we all realised that it was snowing and great drifts were heaped up over the outdoor cafe tables. Only the Canadians and Australians indulged in a snow fight! There was really no wind so we were surrounded by mist and the quiet falling snow, like magic. On our descent half an hour later we spotted two Chamoix or mountain goats, perched on one of the cable stanchions. We later read that snow had closed the Brenner Pass the border crossing over the Alps between Italy and Austria. We returned to Munich where the Ice Spirits were dancing too but no magic snow. PS: The warm wind which blows over the Alps and often causes snow to melt dangerously is called ‘Foehn’. It occurs in other parts of the world such as USA, South America and Australia around Wolllongong.